This program offers clients a variety of services and support throughout the entire employment process including resume building, interview skill building, job development and training. Our staff members work diligently to offer job placements in the community and provide personalized support for each individual, centering efforts on the individual’s interests and abilities. Our Group Supported Employment services offer job positions in the community with continuous support provided by staff members. Individuals work in small groups of 4-6 supervised by an Artisans staff member and earn pay based on productivity. Staff members provide training, job development and the supervision necessary to create a constructive work environment. Click here to view a list of current services offered to community members and businesses through our Group Supported Employment Program. Contracted with the Division of Vocational Rehabilitation in Spokane, individuals eligible for Vocational Rehabilitation Services work with Artisans staff toward obtaining and maintaining employment. Staff members provide job training, job development, and when needed, the onsite support necessary to help DVR clients find and maintain employment on a case by case basis. This program offers support for individuals with a vast array of disabilities that vary from physical, mental and developmental disabilities. Employment services available through Artisans include Trial Work Experience, Community Based Assessment Services, Job Placement, Job Retention Services and Intensive Training Services. We will help walk you through the intake process with DVR. Click here for more information. Participants enrolled in Community Inclusion receive services focused on activities and goals related to community engagement and integration. This program is designed for clients who have either reached retirement age or are in need of skill building and community integration to prepare for employment. This occurs through volunteer work, social outings or other community based activities. 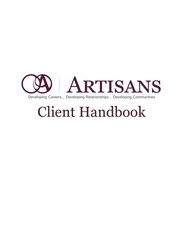 Download a copy of our Client Handbook today for more information about our programs by clicking here or on the image of the Client Handbook to the left.